Discussion in 'Cards: Strategy and Rulings Discussion' started by Kire3003, Mar 24, 2008. Wat do u think ppl?? I think you need to learn to type better, for one. A stage one that only poisons it is... bad. Mismagius is much more effective due to its ability to knock out either Gardevior, Gallade, or the Lv X.
Im tired of G&G tech and G&G anything threads. Its ok,not the best tech. Lucario could knock out Gallade and Gardevoir. I Know this Is the wrong forum but don't judge him, It's only a small mistake. I've done this before. You really need to be more clear. I think I may have played you or your friend. beucase I played someone who clamed to have me "locked"
By looking at your profile I played you. That game was epic and you made a mad good comeback. this is very interresting... but its only works if gardevoir use any energy that provide grass. BTW its a nice idea. The problem is that any good G&G player will have a back up Gardy on the bench to prevent you from stopping telepass. Muck is NOT the best tech by far. Still Muk's problem is that it does 50 for 3... as someone said you might as well play Mismagius. 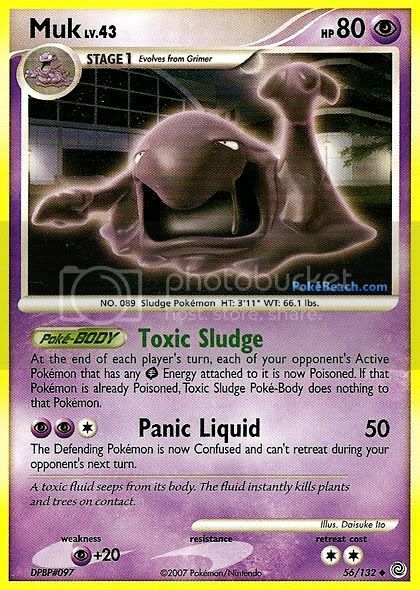 Mismagius is also a good tech for GaG as well, but Muk covers more of a spectrum of the metagame solely because of the fact that DRE's and Scrambles are pretty much a staple in every deck due to their versatility and speed. Muk is like a pseudo-crystal beach in the sense that it punishes/prevents your opponent from playing them while allowing you to playing them safely. Also, 50 at first glance isn't too impressive for Muk, but its ability to confuse amd prevent retreating makes facing Gardy/gallade a bit easier. Its good and I advise everyone to try it. I dont think that muk is a very good tech and that there are many more better techs like mismagius. It can't kill a gardy or a gallade unless you have a lake boundary with some pluspowers but the point is, try something else. a better tech for gardy gallade decks is gyrados. it kills gardy's main offender, magmortar. another better one than muk is weezing from great encounters. it poisons, and instead of adding one damage counter in between, it adds two, or if you have 2 weezing in play, 3, and so on. actually, wait. this HAS to be good. look at it this way people. this made top 4 in NEW YORK state. imagine how many people there are at new york final states! You almost always have a DRE or scramble on it so wouldn't it poison your own active? Me likey...and isn't there Arbok d that does something interesting? No b/c the pokebody only works on your Opponents Pokemon. Muk Is not good, It can be easily be knocked out of It's ridiculously 80 Hp.